What’s tomorrow’s mobility going to look like? And what’s the taxi industry’s role in styling that new mobility? Or continuing to work in it? These and other questions were asked by the organisers and participants at the sixth annual international Taxi & Mobility Update conference, held in Brussels on 19 and 20 April. As always, the conference focused on the current situation in the market between the classic taxi and private hire sector and regular public transport. In this market segment, new technical developments (autonomous vehicles) are encountering new mobility models (microtransit) from completely new market parties (OEM’s, car manufacturers). The justified question of this conference was therefore: ‘Who is in, and who is out of tomorrow’s mobility?’ And what roles do the different actors play? Some 85 taxi operators, consultants, public transport specialists, mobility experts, government representatives, licensing authorities, technical specialists and other experts from various countries discussed tomorrow’s mobility and followed 20 specialist presentations at this unique, compact and traditionally highly-focused conference. Taxi & Mobility Update also gave a compact overview of the present state of the rapidly changing mobility market and the resulting challenges for the future. Almost no theme was skipped. 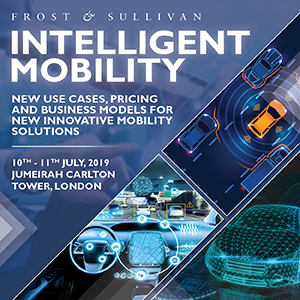 Shwetha Surender from mobility consultants Frost & Sullivan gave a good kick-off in her keynote and showed how not only the Uber’s and Lyft’s of this world work and partly control the mobility market, but also OEM’s, the car manufacturers, are getting stronger with taxi-like microtransit systems using small vans pooling passengers. These are systems like ViaVan (Daimler), Chariot (Ford) and MOIA (Volkswagen). Caroline Cerfontaine of the world public transport organization UITP saw an important guiding and coordinating role for regular public transport in this new mobility world – including for new concepts like Mobility as a Service (MaaS). The theme of ‘combined mobility’ also fitted nicely with the presentations of the new electric ‘London’ TXE taxi by Benelux-importer Green Roads and the electric midi bus Jest presented by Turkish Karsan, a vehicle which would fit both microtransit-systems and MaaS. How the practice of using e-taxis can be financially and economically viable, was illustrated by Gamis el Bouakili of Amsterdam airport company Schipholtaxi. Use of e-taxis cannot happen without a supporting policy (like promoting the roll-out of charging systems) by local and national government. Running the e-cabs is quite possible without a subsidy, the taxi operator demonstrated. Remarkably, Professor Lieselot Vanhaverbeke (who is examining the use and effects of autonomous vehicles – soon also in a practical test with taxi company Taxis Verts in Brussels) and advisor Alwin Bakker (Resultancy) argued that the use of completely autonomous vehicles (level 5) is still decades away from us. Bakker’s estimate in particular was considerably less optimistic than last year. However, both speakers envisage the use of ‘simpler’ autonomous transport systems in the shorter term (level 3, 4). Lawyer Pieter-Jan Aerts briefly explained the effects of the ‘Uber’ judgment of the EU Court of Justice (December 20, 2017) in which the court rules that Uber is a transport company, and discussed the question of whether the EU will actually develop European taxi policy. That’s unlikely, he concluded, unless the EU feels forced to do so (for example, by the recent court case in the European Economic Area focusing on taxi market restrictions in Norway). Lawyer Herwig Kollar illustrated how a classic and according to many ‘old-fashioned’ German taxi legislation offers consumers affordable and good quality taxi services throughout the country. But he also could not deny that with the current political climate in his country and with few allies for the taxi sector deregulation is likely. The Dutch taxi image did not provide any particularly good examples of this deregulation (in 2000): the excesses that resulted from the deregulation of the taxi market in the big cities and the lack of taxis in many towns outside these cities caused a lot of discussion. It seemed like the Dutch model is not the one to follow. Adviser Hein Maas illustrated some positive effects of Dutch re-regulation via TTO’s (small self-policing and self-disciplining driver associations) and in particular through quality mark-systems in a number of smaller cities. Karhoo’s Michael Galvin, an old hand in the taxi world, indicated that the transport of people has always been a chaotic business. And that will remain so in the future, according to him. He expects strong consolidation in the taxi sector and advises taxi companies to collaborate more with colleagues and thus jointly shape the future of the taxi sector. The app mytaxi, according to Claudia Breure, which is now active in a large number of European countries, is making a substantial contribution to this cooperation. Simon Buggey of the Transport for London (TfL) licensing authority admitted that the number of private hire vehicles (mainly Uber) has now become a multiple of the number of taxis (120,000 versus 23,500) and new policies will have to be introduced to balance both systems. Steve McNamara from LTDA, who represents the London taxi operators, does not expect Uber to receive a new permit from TfL in June this year. Presently Uber runs without an operating licence pending the revision of Uber’s London case. That there is a huge gap between regulation in Western Europe and in Russia, was illustrated by Irina Zaripova, who for years has been campaigning for proper taxi regulation in Russia. She illustrated that the Russian regions are moving towards tighter regulation and proper protection of driver and customer. Irina Zaripova is campaigning for proper taxi regulations in Russia and protection for drivers and passengers alike.